CEBU, Philippines — The weak El Niño is taking its toll on crops and fisheries in Cebu province. The provincial government, through its Provincial Agriculture Office (PAO), recently launched a damage assessment survey across towns and cities to check the extent of the damage. Provincial Agriculturist Roldan Saragena told reporters on Thursday that “fish kill” was reported in Mandaue City aquafarms. He said the local agriculture office counted at least 4,900 dead bangus (milkfish) in its 0.5-hectare fishpond. The loss was pegged at P83,000. Remario Cobong, president of a fisherfolk association in Barangay Jagobiao, Mandaue, confirmed the fish kill report. She attributed the fish kill to the hot weather and water contamination. PAO and Mandaue City Agriculture Office are still validating the fish kill reports. 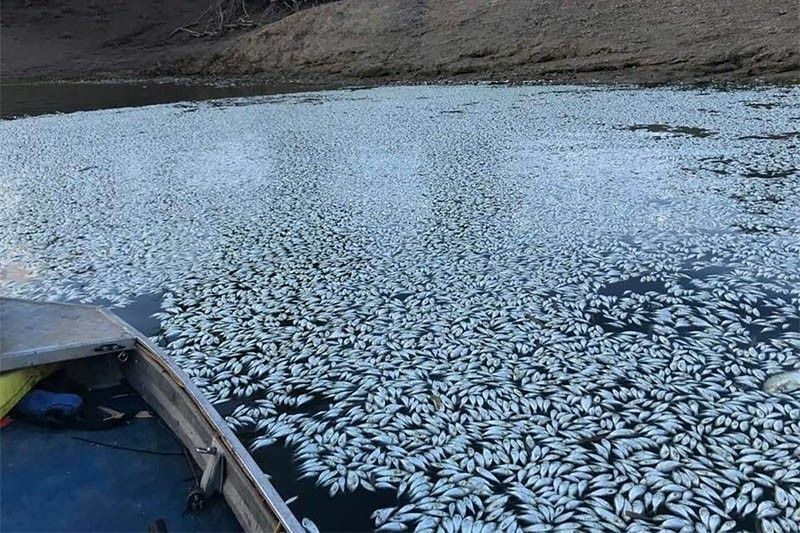 Oxygen depletion and overstocking; pollutant toxin; natural toxin and diseases from bacteria and fungi are among the causes of fish kill, the Bureau of Fisheries and Aquatic Resources (BFAR) said earlier. BFAR said the El Niño may also have a negative impact on aquaculture since high temperatures hasten the decay of organic matter and promote plankton bloom that could result in a fish kill. Also, high temperatures affect the breeding and growth or survival of fry and fingerlings. As to decline in fish catch, Grace Go of the Mandaue City Agriculture Office said it is prevalent already. She said most of the fishes affected by the hot temperature are bangus and shrimps. “Fishery production has reduced with slow growth of fingerlings,” she said. Initial findings showed the fish kill was due to the water’s extremely low oxygen content. Alcantara town and Carcar City also reported loss of fish stocks in some of their aquafarms. In Alcantara, some fishers claimed that the volume of fish caught has now reduced to a mere kilo from three kilos of fish a day before. They said fish catch was abundant before. While in Carcar City, fishers conducted “emergency” harvest by transferring fishes to other fishponds. Decrease in water level and slow growth of cultured species have also been experienced there. Other towns also reported damage in their vegetation, crops, and other agricultural products. These are Argao (corn), Dumanjug (corn), Balamban (rice), Sibonga (vegetables), Badian (corn and fish stocks) and Oslob (water supply). Saragena said some corns in Argao have wilted due to lack of water. He said 20 hectares of corn field in Dumanjug are also affected. Rice crops planted on the 2.3 hectares rice field in Balamban town are also damaged with an estimated value of P200,000, he said. In Sibonga, vegetables were also damaged. The El Niño has affected the 7.5-hectare eggplant plantation, 0.5-hectare string beans, 0.55-hectare okra, 0.25-hectare tomato, and 2.5-hectare banana plantation, said Saragena. On the other hand, water supply in Oslob has also decreased affecting the agricultural lands there. Meanwhile, all hotel, resorts, sports recreational facility and residential owners are urged to conserve their pool water for emergency purposes. Cebu City Councilor David Tumulak said owners should know how to reuse the water from their swimming pools to help minimize the utilization of water at the height of El Niño. He said pool owners may call his office for the deployment of water tankers. “Instead of disposing pool water during replacement, why not preserve it? It would be a big help in case of emergencies like fire,” he said. He said the fire department is using potable water from Metropolitan Cebu Water District. “We could save a lot of potable water if pool owners would help us,” he said. Earlier this month, the 28 upland barangays of the city are experiencing water shortage due to El Niño. The affected barangays include Busay, Pulangbato, Budlaan, Binaliw, Mabini, Agsungot, Malubog, Taptap, Adlaon, Guba, Lusaran, Cambinocot, Paril, Sirao, Pamutan, Toong, Sapangdaku, Kalunasan, Buhisan, Pung-ol Sibugay, Babag, Bonbon, Sudlon 1, Sudlon 2, Sinsin, Tagbao, Tabunan, and Buot Taop.